You may have noticed from previous posts that I really like cool chandeliers. Their designs are practically limitless! 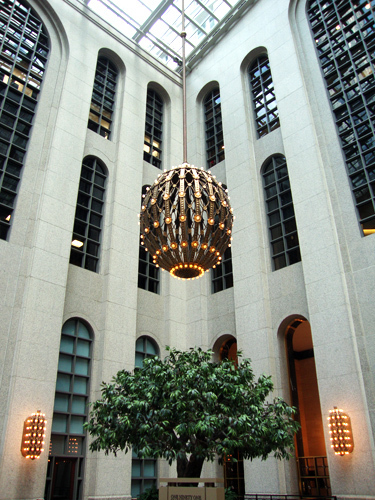 One of my favorites, actually a set of four, resides in the lobby of the 191 Peachtree Tower, also called the Power Tower, a nod to its high profile tenants. To give you an idea of the size of these chandeliers, the lobby is flanked front and back by 70-foot archways and the lobby ceiling is a towering 100-feet high. One of the things that I like about these chandeliers is that their Faberge-esque design takes me back to the Kremlin in Moscow, Russia, where I toured a Faberge exhibition in 2004 where I saw a number of Faberge eggs and many other brilliant works of jeweled art. Other chandeliers that I've posted include the Nepenthes Chandelier, the Mori Chandelier, and the Governor's Mansion chandelier, to note a few. ATLANTApix: "The Rites of Spring"
ATLANTApix: Have Fun With Your Photos! ATLANTApix: A Purple Cactus...plant or cocktail?